The root knot nematode species, M. incognita, is the most widespread and probably the most serious plant parasitic nematode pest of tropical and subtropical regions throughout the world. It occurs as a pest on a very wide range of crops. Affected plants appear in patches. Estimates of vegetable crop losses due to Meloidogyne species, mainly M. incognita and M. javanica, have ranged from 17 to 20% for aubergine (Solanum melongena), 18 to 33% for melon and 24 to 38% for tomato. 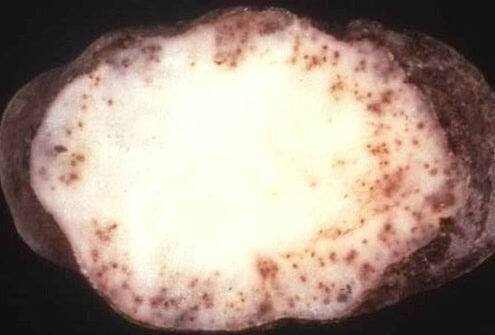 Losses of potatoes due to Meloidogyne species, mainly M. incognita, are estimated at 25% or more. Root-knot nematodes affect a wide range of crops, particularly vegetables. M. incognita is a major economic pest of food legumes in the tropics and subtropics. Common bean (Phaseolus vulgaris) is very badly damaged by Meloidogyne species in the tropics. Cowpea (Vigna unguiculata) is another very susceptible host crop of M. incognita. Many crops grown as vegetables are susceptible to the nematode particularly tomato, aubergine, okra, cucumber, melon, carrot, gourds, lettuce and peppers. Table I shows susceptibility of various commonly grown crops to root-knot nematodes. Root-knot nematodes (Meloidogyne incognita /M. javanica) Roots of severely attacked (left) and healthy plant (right). Affected plants are normally stunted and eventually wilt and die. The most characteristic symptom is formation of root galls (knots) and these can be seen with the naked eye. Affected roots rot. Affected plants are stunted and yellow and have a tendency to wilt in hot weather. Very heavily infested plants are killed. Affected plants appear in patches. If infested plants are pulled from the soil, the roots are severely distorted, swollen and have lumps known as galls or root knots. The galls range in size from smaller than a pinhead to 25 mm or more in diameter. Leaves, roots and whole plant. 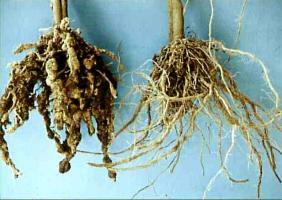 Roots: galls; reduced root system; swollen roots. There are four species of root-knot nematodes (M. arenaria, M. hapla, M. incognita) and M. javanica) that are capable of attacking vegetables. These species occur in Kenya (National Horticultural Research Station, 1984) and are particularly serious in irrigated fields. Important environmental factors that influence development of Meloidogyne are moist soils and relatively warm temperatures. Some plant penetration by root-knot nematodes occurs between 10 and 35degC, with the optimum at about 27degC depending on the species. No eggs are laid at temperatures lower than 14.2 or higher than 31.7degC. Under average conditions a female produces 300 to 800 eggs. A new generation can arise within 25 days, but under less favourable conditions, the time may be prolonged to 30 to 40 days. All species, with exception of M. hapla are killed by freezing. Root-knot nematodes measure about 0.5 mm to 1.5 mm in length. Juveniles (young nematodes) penetrate the root tips and occasionally invade roots in the zone of root elongation. Invaded nematodes initiate the development of giant cells in the root tissues and galling of roots occurs. 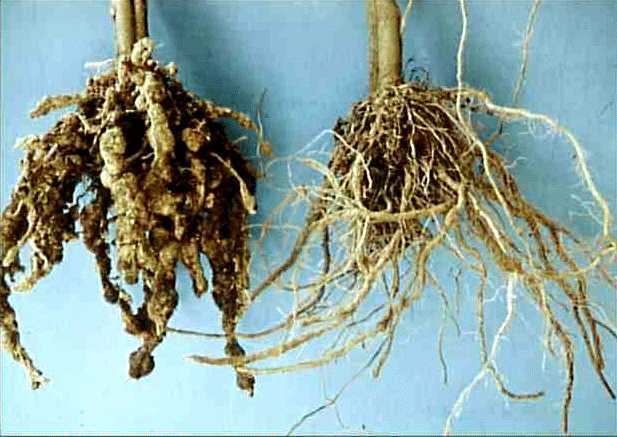 Root knot nematodes are soil inhabitants. They are spread by transplanting infested seedlings, or from soil washed down slopes or sticking to farm implements and farm workers. They may also be spread by irrigation water. Further below you find concrete preventive and curative methods against Root-knot nematodes. Do not locate seedbeds where vegetables have been grown previously. After preparation of the seedbed, burn the topsoil using dry leaves or other waste plant material. Use biofumigation where possible for more information on biofumigation click here. Different mustards (e.g. Brassica juncea var. integrifolia orBrassica juncea var. juncea) should be used as intercrop on infested fields. As soon as mustards are flowering they are mulched and incorporated into the soil. While incorporated plant parts are decomposing in a moist soil, nematicidal compounds of this decomposing process do kill nematodes. Two weeks after incorporating plant material into the soil a new crop can be planted or sown. Maintain high levels of organic matter (manure and compost) in the soil. Incorporate neem cake powder into the soil if it is available. Fields should be ploughed deep and the followed by a dry fallow. Uproot entire plants from the field after harvest and destroy crop debris. Rotate with onions, baby corn, sweet corn, maize, millet, sorghum, sesame, cassava or Sudan grass. 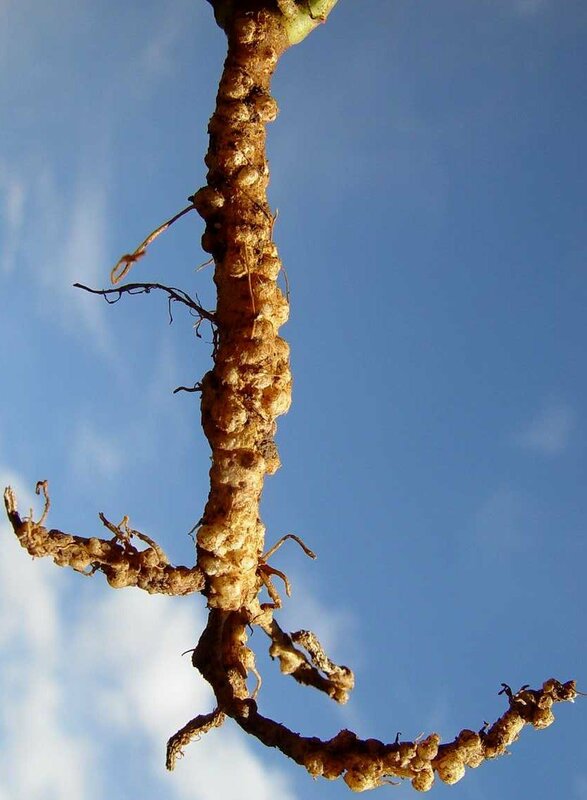 A rotation system called "STRong" is recommended for management of root-knot nematodes. The system was developed by, African Farmers' Organic Research and Training (AfFOResT), a NGO in Zimbabwe. It involves planting in rotation of a susceptible crop (e.g. tomatoes), followed by a tolerant crop (e.g. cabbage) and then a resistant crop (e.g. onions) before a return to a susceptible crop (e.g. tomatoes). Crop susceptibility of various commonly crops is given in Table 1. Use trap crops such as marigold (Tagetes spp.) and Indian mustard. (A trap crop is a crop planted to attract a pest and is then destroyed together with the pest). Mixed cropping with marigold can also minimise root-knot nematode damage. Use resistant tomato varieties (e.g. 'Caracas', 'Kentom', 'Meru', 'Piersol', 'Roma VFN', 'Tengeru 97', 'Zest F1', 'Star 9001', 'Star 9003'). Tomato varieties carrying 'VFN' label are tolerant to root-knot nematodes. Most of these varieties are commercially available in the region. Beije C.M, Kanyagia S.T., Muriuki S.J.N., Otieno E.A., Seif A.A. and Whittle A.M. (1984). Horticultural Crops Protection Handbook. National Horticultural Research Station.